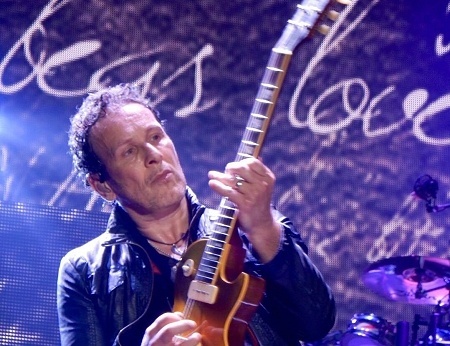 Def Leppard guitarist Vivian Campbell was interviewed in December 2016 about Last In Line and the full audio is available. Vivian spoke to Australian journalist Steve Mascord on 2nd December at the Last In Line show in Sheffield. Vivian talked about Last In Line, the Heavy Crown album, their 2016 tour and mostly Jimmy Bain's death. He mostly spoke about Jimmy Bain and how his death impacted Last In Line's plans before they regrouped with new bassist Phil Soussan in Spring 2016. Vivian's part runs from 9:45 to 17:43 minutes into the one hour podcast. 'Martyr' is also played in full after Vivian talks. "I am well thank you and I'm not from Sheffield but I can do like a Yorkshire accent. A very bad one. I've spent a lot of time here obviously although only one of Def Leppard lives here now, Sav. He's been back and forth between here and Dublin over the years but he's settled now back in his home town." "Yeah it's been a strange year. I'll be glad to see the back of it you know. I mean it hasn't been all bad but yeah there have been some events. I'm here tonight with Last In Line obviously we're playing. This is the second to last show of our tour. We end in my home town of Belfast tomorrow night, but you know the Last In Line record was, it's a passion project you know. It's been really great for me as a guitar player to get back to reconnecting with Vinny and with Jimmy Bain and meeting Andrew Freeman for the first time. And we got the chance to make what we believe is a great record and we've been very encouraged by the response to it." "We were so excited about it and a month before the record was released, Jimmy passed away. So that really took the wind out of our sails. We had a major tour in the US planned for February, March and April. We had to cancel that. By April we ended up picking up the pieces. We got Phil Soussan, the former Ozzy Osbourne bass player to join us and Erik Norlander on keyboards to complete the line up." "So we went out and started doing some dates 'cause we felt we owed it to ourselves and we certainly owed it to Jimmy and to his memory because we did make a very strong record. And it seemed like the appropriate thing to get out there and to support the record and not to let it wither on the vine you know. So like I said we've been really, really encouraged by the response people have had to the album, and indeed to these live shows. It's just great fun playing this kind of music. It's really aggressive guitar music and it's been a long time since I had to exercise that muscle. I'm really, really enjoying it you know." "Well he must've known something was going on. The thing about Jimmy, Jimmy really couldn't cope with life very well you know like if he would get a parking ticket, he'd tear it up and throw it in the bin. If he got a bill from the tax man he'd do the same thing. Jimmy just couldn't deal with the regular kind of thing and he could've been eligible for the other thing in the States called Medicaid. Jimmy didn't really have much money. He didn't have a pot to piss in to be honest you know. He wasn't very good managing his money and to be fair also he was kind of short-changed by a lot of the people he worked with in his career." "So - but he's also the kind of person who would've just ignored things too. He would've put his head in the sand and just said whatever you know. Jimmy died with his boots on you know. We knew he was ill about a month before he died and we were rehearsing and getting ready to do some shows and we were headed to do the cruise with Def Leppard. And we Last In Line played a show in Miami the night before the cruise ship sailed and that was Jimmy's last gig. He died on the ship." "We offered him, the week before, we said Jimmy you know we don't have to do this. We can cancel this, your health is more important, but Jimmy wanted to do it. And he must've known that he was that ill. I mean he must've felt in his body. We knew he had pneumonia at least but it turns out that was a bi product of the lung cancer that actually took his life." "But Jimmy just, he was a trooper to the end. You know he was a rocker and like I say he died doing what he loved you know. He died with his boots on." "Well you know we're here tonight with the Last In Line project and Jimmy loved the band so much that he went and got a tattoo of Last In Line on his arm. And it was the only tattoo he had on his body. He just felt so connected to this band and the last couple of years of his life. He was really overcoming his demons of addiction, and the one thing that I think that really helped him get through that time in his life was this band and this project. Writing music for this, and Jimmy was a great riff writer and one of my favourite songs on the record was titled 'Jimmy F Sharp, Fast' until Andy wrote a lyric for it. And actually when we recorded the track, we hadn't hard what Andy was gonna out on the song yet. So we were still calling it 'Jimmy F Sharp, Fast' and that song is Martyr, and so that always reminds me of Jimmy and it always will."